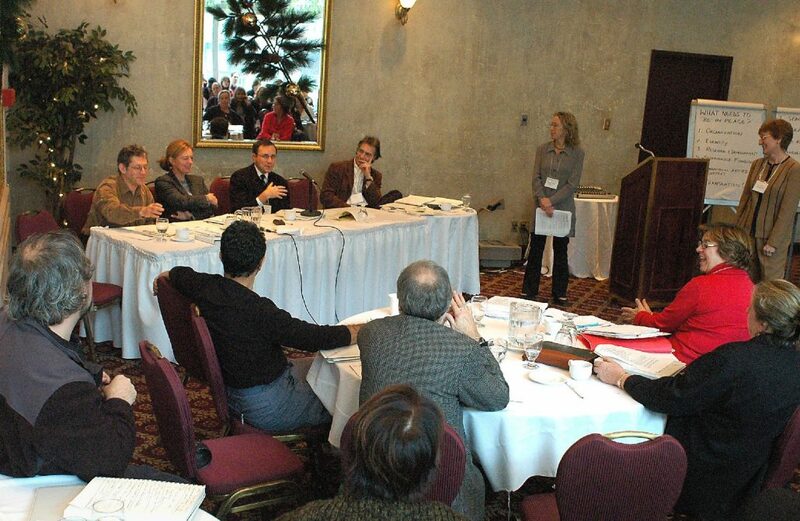 ELAN was conceived in November 2004 at the Quebec Arts Summit in Montreal. More than 200 artists, government officials, and other representatives of the English-speaking arts milieu came together for the first time to discuss supporting artists and cultural workers in Quebec’s official language minority community (OLMC). In the preceding three decades, hundreds of thousands of English-speaking Quebecers had left the province. Around the new millennium, a new spirit of optimism began to emerge. English-speaking artists wanted to break down old stereotypes, identify common ground, and consolidate links with French-language communities. The challenge was to build a sustainable community and create conditions that would empower English-speaking artists to stay and thrive in Quebec. Participants at the Quebec Arts Summit concluded that an English Language Arts Network could help meet this challenge. With the support of sister organizations the Quebec Drama Federation (QDF), the Quebec Writers’ Federation (QWF), and the Association of English-Language Publishers of Quebec (AELAQ), the wheels were set in motion. ELAN was incorporated in April 2005 with initial funding from the Canada Council for the Arts and the Department of Canadian Heritage (PCH) through the Interdepartmental Partnership with the Official Language Communities (IPOLC) program. Since 2005, ELAN has built a repertoire of activities to support and celebrate Quebec’s English-speaking artists of all disciplines, regions, and backgrounds. Through networking events, ELANews (monthly email newsletter), needs assessment surveys, and major projects like the Arts Alive! Québec community festival series, ELAN has worked to bring Quebec artists closer together and spread their work far and wide. Catching the attention of decision-makers. through essays, biographies, and video profiles as part of the RAEV project in 2011 (Recognizing Artists: Enfin Visibles!). See them under Past Projects. with Culture Montréal, Diversité Artistique Montréal, MAI (Montréal, arts interculturels), and other French-speaking organizations. a site that gathers and translates media coverage of English-speaking artists’ successes for a French-language audience. Its 2013 launch received extensive positive coverage from English and French media (e.g. CBC, Le Devoir, La Presse) . with Arts Alive! Québec festivals in Hudson, Québec City, Knowlton, Huntingdon, Wakefield and Montreal’s West Island, in 2015 and 2016. Sellout crowds and town-wide parties have paved the way for ongoing collaboration between participating communities. Quebec’s English-speaking artists are resilient, resourceful, and talented beyond measure. They represent an immense variety in experience, expression, and linguistic and cultural identity. We’re committed to helping our members and community contribute to Quebec’s unique cultural life. ELAN wouldn’t have come this far without the support of artists and cultural workers it serves. Contribute to the next chapter of ELAN’s history! You’ll receive ELANews, a free monthly email newsletter full of job opportunities, calls for submissions, ELAN member events and successes, and updates on important issues – plus information about ELAN’s own activities. Follow ELAN on Facebook and Twitter for news, articles, and events on a daily basis. Get in on the action at ELAN’s next event. Show your support by becoming a member today! Click here for more information on ELAN’s past projects. Minority Report: An Alternative History of English-Language Arts in Quebec (Guernica Editions, 2011) – Email ELAN to purchase a physical copy ($20), or read the essays online.